Highway and railway swing bridges carry trucks and trains from Rough and Ready Island into the Port of Stockton.The Navy Drive Bridge (29C0023) is a camelback Howe truss swing bridge that was built in 1941. The bridge includes concrete T girder end spans and a lot of timber fenders around the central pier. 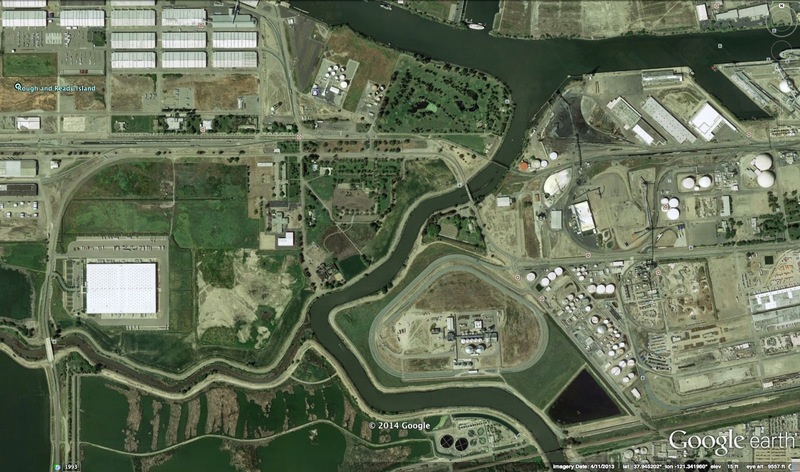 In the Google earth photo above we can see the two swing bridges crossing the San Joaquin River near the center of the photo. Yesterday's Dagget Road Bridge is near the bottom left of the photo and the third Abts truss bridge crosses the San Joaquin River near the bottom right in the photo. San Joaquin County, California Bridges: Navy Drive Bridge across the San Joaquin River by Mark Yashinsky is licensed under a Creative Commons Attribution-NonCommercial-NoDerivatives 4.0 International License.